Eligibility: Minimum requirement for Education Scholarships is 65% marks by boys and 60% obtained by girls in the last Examination. But the scholarships will be given on merit as per availability of budget. Total annual income of parents of such students must not exceed Rs. 200 Lac (Pa Two Lac only) from all sources. Income Certlficate/Affidavit will be attested by EXECUTIVE MAGISTRATE only. How to Apply: Students interested in Education Scholarshipsmay apply on prescribed form. 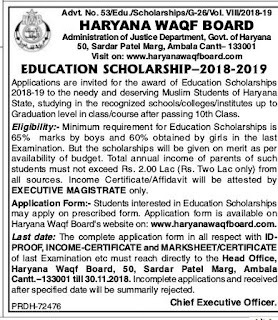 Application form is available on Haryana Waqf Board's website on: www.haryanawaqfboard.com.The complete application form in all respect with ID- PROOFS Income Certificate and marksheets Certificate of last Examination etc must reach directly to the Head Office, Haryana Waqf Board, 50, Sardar Patel PAa rg, Ambala CantL-133001 till 30.11. 2018. Incomplete applications and received after specified date will be summarily rejected. 0 Response to "Haryana Wakf Board Ambala 2018-19 For Education Scholarship"